RUSH: This is Jeannie in Hutchinson, Kansas. It’s great to have you here. How are you? CALLER: I’m good. Thank you so much for taking my call. RUSH: You bet. I’m glad you waited. CALLER: I was initially calling because of how investigative reporting has just gone down the drain over the last decades. 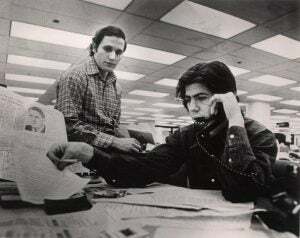 You know, once when Woodward and Bernstein investigated Watergate, they did it covertly, and when they had the facts and were able to prove them, they reported the story. Now the reporters investigate on live TV with the people that they’re investigating, and they just throw questions at them and they don’t allow them to answer the questions, and so then they report rumor as truth, and they throw around phrase, “What did the president know and when did he know it?” They don’t really… You know, they haven’t earned the right to say that because they haven’t really done their jobs. George Stephanopoulos is great at interrupting you and not letting you answer the questions. Katie Couric has done several shows where she’s been proven totally wrong in what she’s presented or how she edited it and that type of thing. RUSH: Look, I know. These excuses, these examples are endless. NBC editing the 911 tape, the phone call from the well-known “white Hispanic,” George Zimmerman, to make it look like he was a racist pig in describing the Trayvon Martin circumstance. There’s no question the media isn’t media anymore, and that’s the best I can say it. There is no media. I mean, do you not even find it strange that there is now this adjective, “the media.” It’s like it’s its own branch of government or its own self-contained entity that is an opposition force to just one of the political parties. It’s not a news-gathering organization anymore. I mean, there are elements of it that do that. But its primary purpose is to advance the political agenda of the Democrat Party. And the media serves as a political opponent to Republicans and conservatives, and everybody just accepts that. That’s just what it’s become: “The media” is yet another obstacle that Republicans have to find their way around or through. They are not highly respected, their public opinion polls. They are maybe the least respected line of work in America today of lines of work that are legal that would be so surveyed. But I get your point. Investigative journalism, there isn’t any. There’s attack journalism, and it’s happening right in front of our eyes each and every day, and that’s exactly right. I mean, you witness it each and every day. And, lo and behold, there’s a great piece today at Townhall by Doug MacKinnon. “White House Adviser Eviscerates a Shell-shocked George Stephanopoulos.” And it goes to describe Miller’s appearance on all the four Sunday shows that he appeared on and how he presented a textbook case for any Republican, if you’re gonna accept the invitation to go on these shows, how to do it, how to not accept the premise, how to come armed with facts, how to just refute every premise presented to you, how to destroy every false bit of information that’s contained in a question. Miller did this time and time and time again with Stephanopoulos. And of course now Miller is being trashed by the Drive-Bys and the leftist agitators. Miller is now being targeted for destruction, if you will, which he knew was gonna happen. Everybody knows it’s gonna happen. That’s when you have to gut it up. You finish an appearance like that, you know you’ve hit a home run for your side, you know you’ve done well, and you hope that it influences others to try to imitate your appearance when they go on TV. And you know you’re gonna get hit for doing so but you hope that it has some kind of long lasting benefit to it. And then you see where your performance, your appearance, stellar as it was, is now coming under vicious assault by the left which cannot allow for people who did not see it to be told about it, and it tries to change the minds of the people who did see it to convince them they didn’t see what they saw. It’s a great place here by Doug MacKinnon. And he says the tape of Stephen Miller with Stephanopoulos should become required viewing for any Republican conservative or faith-based communicators hoping to inject some sanity back into policy debates, hijacked by dishonest, hate-filled, and increasingly inflammatory rhetoric of a growing part of the so-called mainstream media, the entertainment industry, and academia. And it was. It was all of that.